For Tzatziki sauce, peel and seed cucumber and dice finely. Also mince garlic and parsley. Add to a bowl with yogurt and other ingredients and stir together. Store in fridge until needed. Can be made in advance. To make lamb balls, dice all veggies and stir them into ground lamb along with egg and breadcrumbs. Season with salt, pepper, and red pepper flakes. Line a baking sheet with parchment paper for easier clean up and form large tablespoon-sized meatballs with lamb mixture. Flatten each ball slightly into a disc. You should get 20-24 balls out of the lamb mixture. Drizzle lamb balls with olive oil and season with a pinch of salt and pepper. Bake lamb balls at 400°F for 20 minutes, flipping once halfway through. To make a sandwich, separate pita bread so you can stuff it. Sometimes it helps to microwave the pita for 10 seconds. 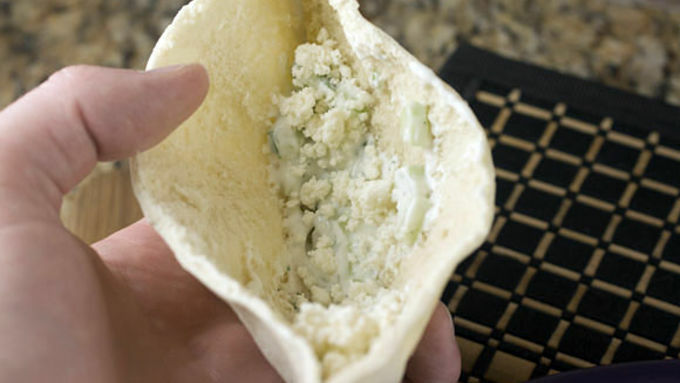 Add a few spoonfuls of tzatziki sauce to the pita along with a pinch of crumbled feta. 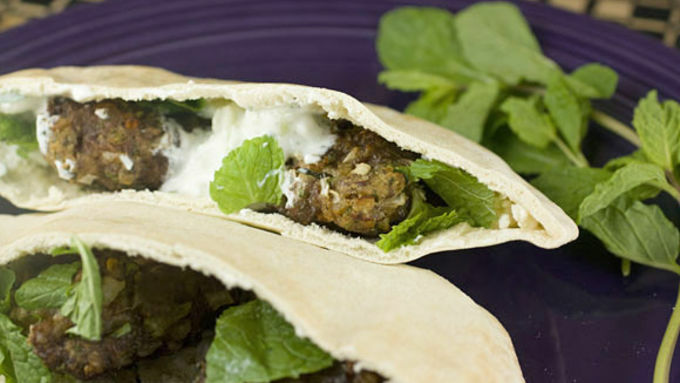 Add 2-3 lamb balls to each half of the pita and garnish with another drizzle of sauce and a few sprigs of fresh mint. Serve immediately! Falafel is generally made with chickpeas, but sometimes a chickpea patty just won’t cut it for me... So I’ll frequently use lamb! 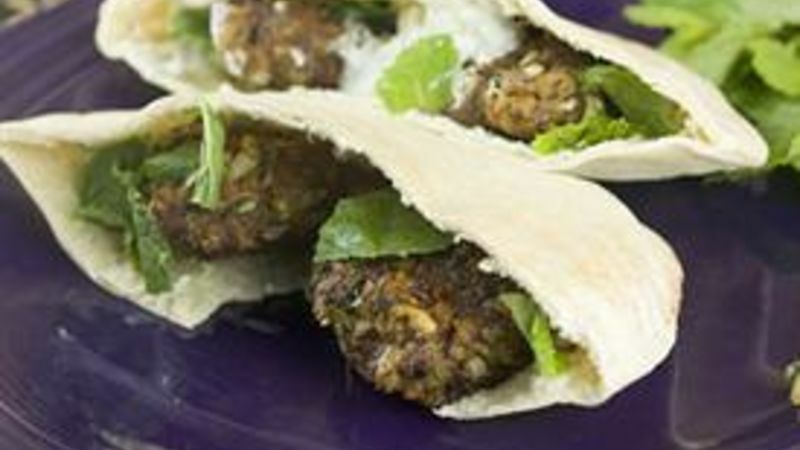 For these lamb falafel sandwiches, the ground lamb is mixed with a bunch of fresh herbs and spices and baked instead of fried. Like many Mediterranean sandwiches, it’s served with a tangy yogurt sauce, crumbled cheese, and fresh mint. Let’s start with the sauce because while it may seem like just a condiment, the sauce is maybe more important than the lamb. It gives some moisture to the sandwich and also a nice tangy kick. You can definitely make this sauce in advance. It’ll keep fine in the fridge for many days. In fact, I think it’s a bit better on day two because the flavors have time to meld. On to the lamb. This recipe is very similar to a lamb meatloaf, actually, that I just form into small balls and bake. 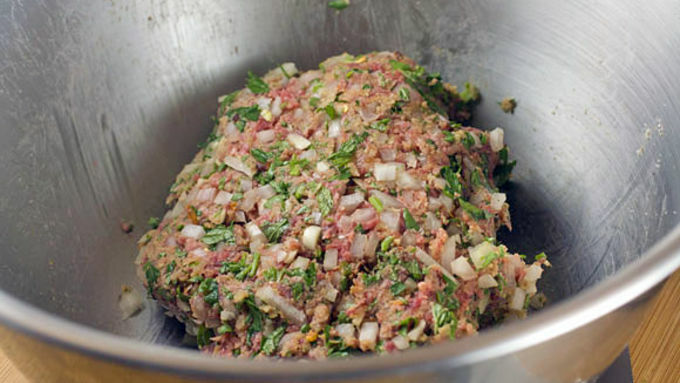 The ingredients will probably look familiar if you ever make meatloaf. The one difference is this recipe has a lot of fresh herbs in it. It might look like too much when you start, but just trust me. The fresh herbs give the final meatballs a fantastic flavor. I love these for dinner, but there’s no reason why you couldn’t make a batch of these over the weekend and take it for lunch throughout the week as well!